5 May 2016. A robotic arm, programmed to work autonomously under direction of a surgeon, was shown superior at soft-tissue surgery with pigs than human surgeons and robot-assisted surgery. Results of these tests, conducted by a team from Children’s National Health System in Washington, D.C., appear in yesterday’s (4 May) issue of the journal Science Translational Medicine. Applying the consistency and reliability of robotics to soft-tissue surgery so far eluded biomedical engineers. Soft tissue in the body includes skin, muscles, tendons, ligaments, fat, blood vessels, and nerves. The authors, led by Peter Kim, associate chief surgeon at Children’s National Health, cite data from the Centers for Disease Control and Prevention that some 44.5 million soft-tissue surgeries take place in the U.S. each year. 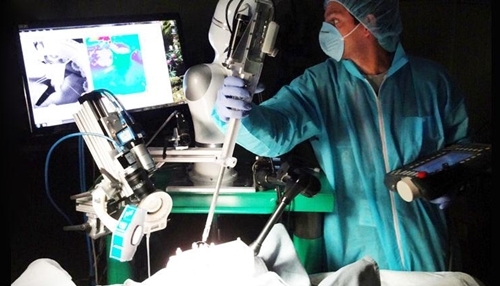 Robotic-assisted surgery, which requires manual control by a trained surgeon, is used today with rigid structures, such as bones, with results dependent on the surgeon’s abilities. Soft tissues, however, because of their flexible and malleable nature, are less predictable and robotics systems are not yet considered feasible for surgery. To help fill this need, the surgical innovation institute at Children’s National Health developed its Smart Tissue Autonomous Robot, or Star, featuring a robotic arm guided by smart 3-D imaging. The arm follows near infrared sensors seeking fluorescent indicators to move around and adapt to the more complex requirements of soft tissue. Star is programmed, with algorithms and software developed by Johns Hopkins University computer scientist and co-author Simon Leonard, to operate under the supervision of a surgeon, but without the hands-on direction of current robotic-assisted surgery systems. Algorithms direct Star to follow a surgical plan, yet still make adjustments in real time as the arm adjusts to pressures and movement of the tissue. The paper reports on common suturing procedures, known as anastomosis, performed by Star on pig tissue. Anastomosis connects tubular tissue, such as blood vessels and intestines, procedures conducted more than 1 million times a year in the U.S. While anastomosis is done frequently, it still runs risks of leakages that can run as high as 26 percent in colorectal surgery and lead to serious complications. Kim and colleagues guided Star to perform anastomosis on intestinal tissue from pigs, first in 5 tissue samples removed from the animal, then in surgery connecting intestines of 4 live animals. Results of the procedures with Star were compared to laparoscopic — minimally-invasive “keyhole” — surgery conducted manually by trained surgeons or with a commercial robotic-assisted surgery system. The results show Star’s suturing was equal to or surpassed the quality of hand-sutured or robotic-assisted sutures, with the system providing more consistent spacing and able to withstand higher leak pressures than the alternatives. The time needed for Star suturing was about the same as average laparoscopic procedures that run between 30 and 90 minutes. Kim is founder of a start-up company Omniboros Inc. in Washington, D.C. that develops smart automated and soft robots.